Salvinia is a free-floating aquatic fern. Salvinia is a fern-like plant with no flowers, native to southern Brazil and northern Argentina. It is stemless, and the leaves underwater are modified into root-like structures. Salvinia's leaves are two small lobes that whorl opposite of each other to create an oblong shape. Usually its fronds have two leaves above the surface and one below. The leaves are light-medium green. In a mature plant, you might see brown around the edges of the leaves. Salvinia can be found free-floating or in mud. Salvinia can be found in the southern half of the Untied States. It is especially concentrated in Eastern Texas and Louisiana. 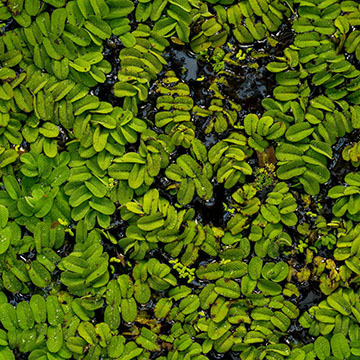 Treat Salvinia with Dibrox® herbicide. Salvinia thrives in nutrient rich water. To better help prevent Salvinia, treat your water with our Nutrient Reducers (MuckMaid®, SparKlear®, PhosControl®). Other alternative treatment products include: Diquat.